On @Alan7140's suggestion in another thread, I have spent the morning playing around with On1's Photo Raw 2019.2 software. I like it. 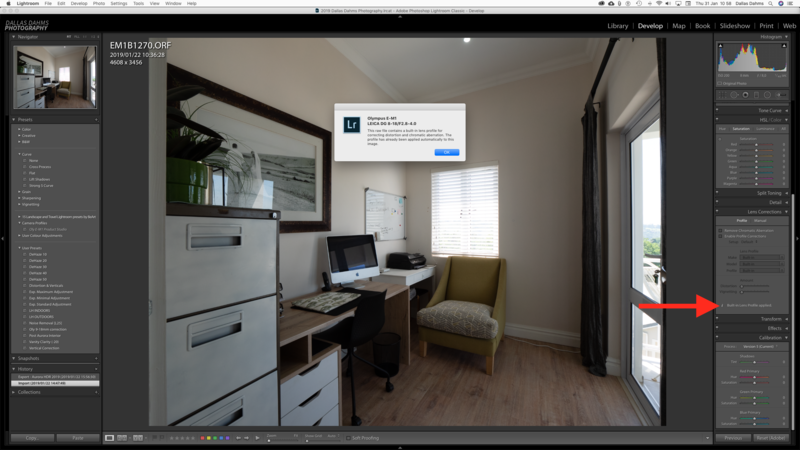 It's quick, it has a great, logical interface and seems to offer most (not all) of the Lightroom functionality I use. However, like Aurora HDR 2019 it is also not automatically applying the lens profiles to RAW images, nor is it doing a particularly good job of making a suitable HDR for my purposes (compared to what Aurora and Lightroom are doing with the same three images). I am also not seeing any batch processing ability, so unfortunately this one won't be a replacement for Aurora/Lr for me (for now). In this screenshot of a base exposure in my bracket you can see the curvature of the Leica 8-18mm as it appears in On1 uncorrected (you may want to enlarge this by clicking on it). I then select the lens detail and it corrects the distortion and fringing. Now take a look at how Adobe Lightroom "fixes" this particular frame. You can see that some cropping has occurred on the extreme left. Not much, but it's definitely eaten more than the On1 software did. 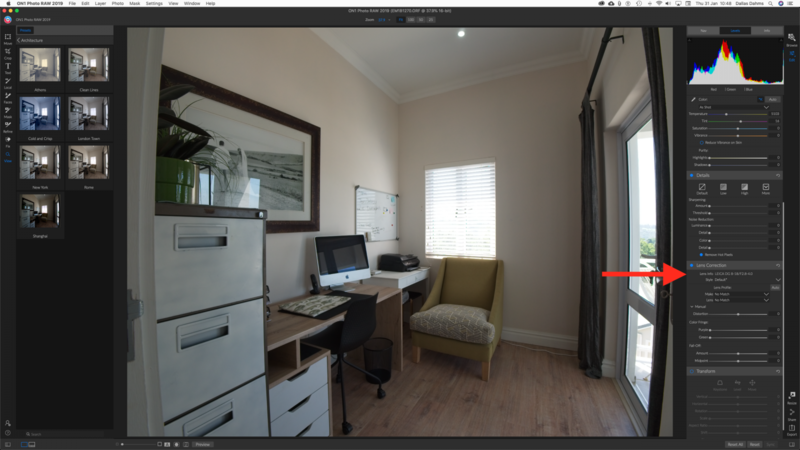 In many of my images Lightroom doesn't seem to be doing anything to correct the distortion or CA and I still see quite pronounced curvature on the edges. When I toggle the "enable lens profile" checkbox there is no difference in what I see. Are any of you guys noticing similar things going on with your Lr lens profile applications? Much and all as I dislike On1 for their pushy marketing and fake discounts, I have found them to be very responsive to queries or suggestions when emailing them on such. In fact a problem I had with gallery-wrap in (what was named at the time) Perfect Resize and which involved me sending them the file concerned saw them not only fix the problem but give me a free upgrades subscription to Perfect Resize as a thank you for bringing the problem to light. So perhaps they can answer your lens profiling and batch questions with similar efficiency. For starters, though, go Preferences>Files and check that the "Apply lens correction automatically to raw files" box is ticked. EDIT: - I just noticed batch HDR is a much requested feature for them to add. I expect it will appear soon, then. It is definitely checked, which is why I was wondering why it wasn't applying it. Good to hear that they are considering bringing in batching for HDR. If that does happen before Aurora is able to answer my question on why the profiles aren't applied in their software, then I think I might lean strongly towards buying On1. I do like the way it works - and cor blimey, is it about a hundred times faster than Lightroom or what? Yeah, it was the speed of the HDR that made me raise my eyebrows - I've tried just about all the HDR programs for Windows over the years and this just blitzes anything else I've used. Thankfully my Fuji lenses don't seem to need any lens correction save the 10-24/4 between 10 and 12mm; by 14mm it's as distortion-free as was the 14/2.8 prime I had before. As the zoom has OIS, I gladly traded the extra stop of speed for the convenience of a wider zoom lens. It might be worth shooting On1 an email querying why HDR isn't correcting the lens when set to do so - it might be something simple, or at least they might correct it when they get around to providing a batch facility. The browser also eats Photoshop Bridge for breakfast and spits it out again. I will definitely send On1 an email about their product and hopefully provide some input on how they can improve it for RE work. Aurora makes use of an AI engine and the results are really quite remarkable. I have a couple of presets that I apply both within Aurora and then afterwards in Lr and the results have been making the agents I work for very happy. If only it could apply the lens profiles then I wouldn't need to use anything else. The first HDR I made with On1 came out very nicely without too much tweaking. However, when it came to the indoor/outdoor (sunny) acid test it didn't fare as well as Aurora HDR did. It wasn't bad, but the colours definitely looked a bit wild, which for RE is a non-starter. With the sheer volume of HDR editing I am doing (minimum of 20 images per property and up to 5 properties a day) I need something that is going to win on all sides and require as little hands on checking as possible. Right now On1 is by far the fastest I have tried, Aurora provides the best results and Lightroom is somewhere in the middle. I also have had a plugin for Lightroom called Enfuse that I bought over a decade ago (it still works on the latest Lr!) and it also gives very good results, but is the slowest by a long way. I also tried Photomatix but wasn't that impressed with it at all. One solution you might try in LightRoom is to apply extra barrel / pincushion and Vignetting adjustments in LR under Lens Corrections on the "Manual" Tab. This works even with the "built-in" lens profile active. Out of curiosity, is the LR version of the built-in profile for raw files the same as the camera's version in a JPG? If you compare a SOOC Jpg with a Raw file in LightRoom, do they both have the same amount of barrel / pincushion distortion with your 8-16 lens? I have noticed that distortion corrections sometimes need a tweak or two depending on the subject distance and the fact that some of the built-in profiles do not do a 100% correction. Besides, you might not want some images to be 100% rectilinear in the first place. i'll check that out, Bill. I haven't shot JPG in years and years though, so I couldn't say for sure if the results between the camera and Lr's interpretation of the raw file are different.